Used worldwide this healing and amazing anti-inflammatory PEMF technology proves helpful in a variety of illness and injuries including soft tissue trauma, fractures, ankle sprains, arthritis, heart disease, stroke, gynecologic pain including PMS, neurodegenerative disorders, MS, migraine, skin ulcers, postop and traumatic wound healing, and virtually any inflammatory problem of stomach muscles, bursa, tendons, or joints. EM-Pulse technology has always been safe and has never had a reported side effect.The EM Pulser weighs five ounces in a 1" x 3" x 5" case and can be used at home, in your car, powered by battery. Two rechargeable batteries are included along with the recharger. You can add an AC Adapter for only $10.00. 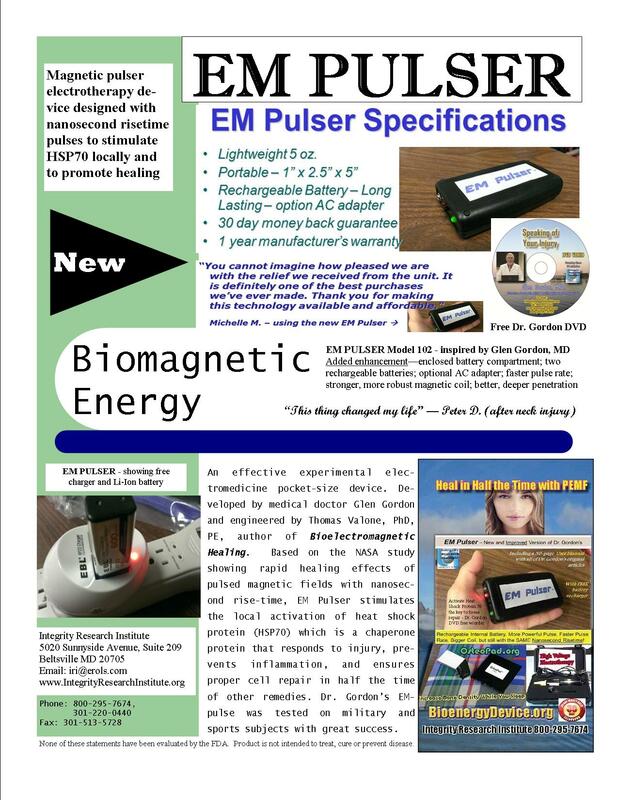 The EM Pulser is affordable technology vastly superior to any other frequency devices and sells at a very competitive price.The low frequency magnetic fields passes completely through your body to heal deep injury and relieve pain. Since it is designed to activate the restorative and healing heat shock protein (HSP 70) within ten (10) minutes, with the famous "nanosecond risetime"of the magnetic pulses (see Dr. Gordon's DVD, explaining the antioxidant and HSP 70 benefits, sent FREE with every order), it has been found to be effective with Arthritis, Bruises, Swelling, Sprains, Cuts, Trauma, Carpal Tunnel, Backache, Sciatica pain, and fracture. Read the one-page EM Pulser specification sheet. "I had cancer removed from my face 2 days ago. I used the Em pulser 2 hrs before surgery. After removal, before stitching I used the Tesla coil for 5 minutes Afterwards the doctor stitched my wound. The doctor and nurse were surprised that there was no swelling or bruising. After stitching I applied Em pulser to wound. I never had pain. I did not use ice at all per dr Gordon’s instructions in his video. The skin removed was 1/2” wide x 3/16” thick" Here is a picture on how it looks 2 days after surgery." Ted S.
"You cannot imagine how pleased we are with the relief we receive from the unit. It is definitely one of the best purchases we've ever made. Thank you for making this technology available and affordable. We just can't stop raving about this unit. I am so glad it can be used while plugged in; my husband and I take turns with it throughout the day. We'll be buying a second one in the near future. Thank you again, and good luck with your sales!" Sincerely, Michelle M.